Straight teeth are healthier teeth, but making the decision to get braces can be daunting. Especially with the images of bulky, metal braces in mind. Thankfully modern invisible aligners, like Invisalign, are now an option. A dentist will usually recommend orthodontic treatment to you in order to improve the appearance and health of your mouth and teeth. 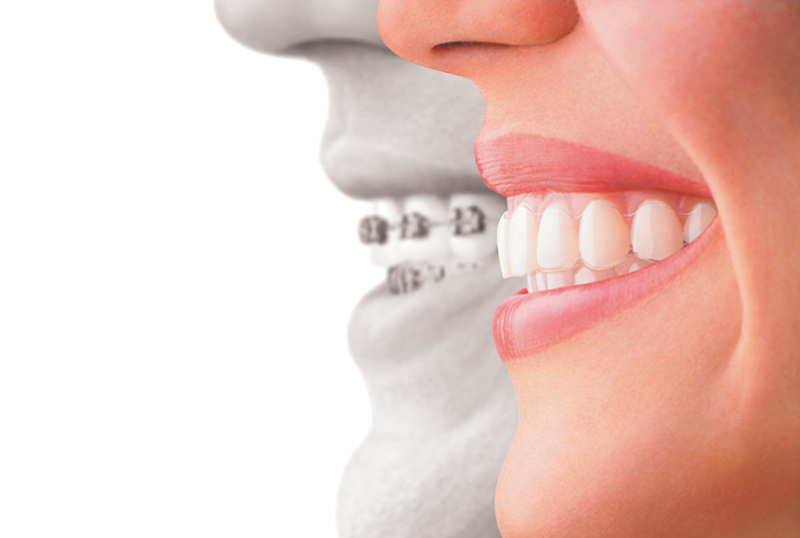 Braces and aligners are fitted to improve overcrowding, crooked teeth, overbites, underbites and incorrect jaw positioning. Straight teeth are easier to brush and floss as they reduce any hard to reach places, meaning your teeth are easier to care for and the build-up of plaque and decay is minimised. A straight smile can also alleviate uneven pressure and wearing on your teeth that can lead to weaker teeth, cracks or chips. At Modern Orthodontics, we use Invisalign for patients seeking a more discreet teeth straightening experience. Invisalign are clear aligners made of comfortable and medically approved thermoplastic trays that are custom made to fit your teeth. They are virtually invisible, because they are clear, so most people won’t even realise you are wearing them. This can alleviate a lot of the stress associated with orthodontic treatment. Invisalign aligners are also removable which means you can keep brushing and flossing as normal to keep your mouth, teeth and gums healthy. Once your experienced orthodontist has identified Invisalign as the best treatment for you, the process of straightening your teeth can take anywhere from 6-18 months. Over the course of your treatment, you will visit Modern Orthodontics every six to eight weeks for new, updated aligners to fit the new mold of your moving teeth. At Modern Orthodontics, it’s our aim to partner with modern technologies to make each patient’s experience as comfortable as possible. We are proud to offer an innovative treatment called Acceledent to our patients undergoing a teeth straightening process. The simple to use, hands-free device offers patients faster orthodontic treatment with only 20 minutes of daily use. It uses gentle micro pulses to accelerate teeth remodeling, meaning that Invisalign patients may see results up to 50% faster than if they used Invisalign alone. It is possible you will have some mild discomfort initially and perhaps again when you get a new Invisalign aligner fitted. This discomfort is evidence that your teeth are moving into a straighter, healthier smile. Some patients are lucky enough to experience no pain or discomfort at all. Acceledent uses SoftPulse Technology when applied to your teeth. These micro pulses are extremely gentle, about 8x less force than a power toothbrush so shouldn’t give you any pain. The micro pulses may even help your orthodontic treatment become more comfortable, alleviating any discomfort you may have. To find out more about Invisalign and Acceledent or to book your free consultation and obligation-free quotation contact Modern Orthodontics today.